Monero [XMR], one of the most popular privacy coins, has been losing its position in the market in terms of price. The coin that once belonged in the top 10 club is currently the thirteenth-largest cryptocurrency by market cap. Moreover, the coin has lost almost 90% of its value since its all-time high, which was recorded in December 2017. 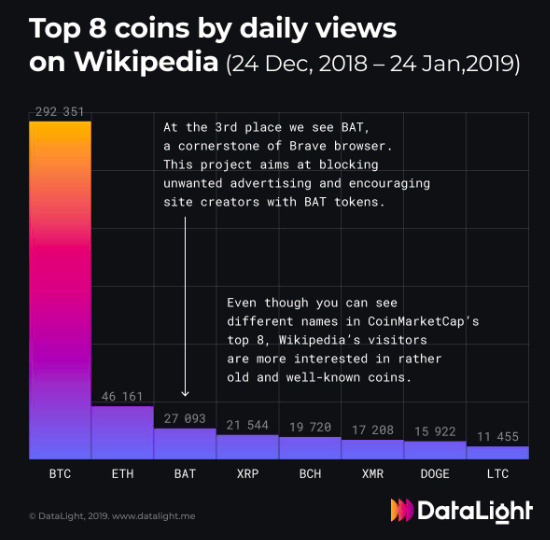 Despite the massive plunge in its price, Monero continues to be one of the top eight coins by daily views on Wikipedia, according to DataLight, a cryptocurrency data analytics platform. During the timeframe of December 24, 2018 to January 24, 2019, Monero has ranked the sixth most viewed coin on Wikipedia. The coin has a total of 17, 208 views between this time period. Earlier this month, news broke out that $10 million in Monero [XMR] was demanded as ransom in Norway by kidnappers. Elisabeth Falkevik Hagen, spouse of one of the richest men in Norway was kidnapped from her house. The case drew a lot of attention as the victim was missing for more than ten weeks and the police failed to find any evidence related to her safety. Surprisingly, Basic Attention Token [BAT] has taken the third position in this list. The coin has a total view of 27, 093, during the one-month duration. The cryptocurrency recently hit a market capitalization of $155.88 million. According to the data, the most viewed cryptocurrency is Bitcoin [BTC], the largest cryptocurrency by market cap and the very first one, with 295,351 views. The coin is followed by Ethereum [ETH], the leading smart contract forum and the third-largest cryptocurrency, with 46,161 views. XRP, the second largest cryptocurrency, has also made it to the list with over 21,544 views. The coin is followed by BCH on the fifth position with 19,720 views on Wikipedia. Dogecoin [DOGE] and Litecoin [LTC] have taken the seventh and the eight position, with 15,922 and 11,455 views to their respective Wikipedia pages.